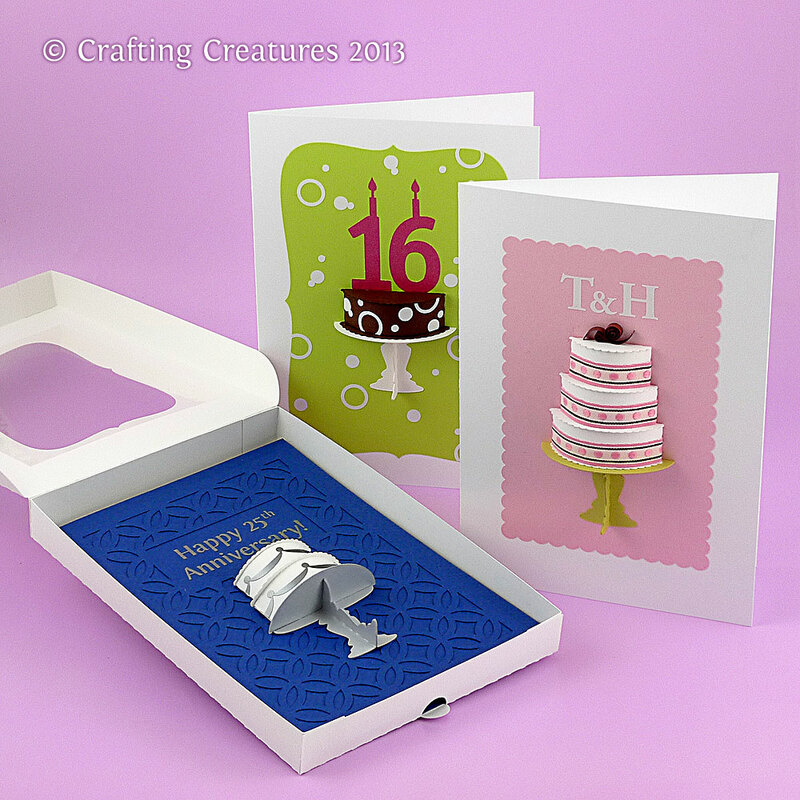 I'm quite excited to offer these 3D paper cakes, easily customizable for a birthday, wedding, or anniversary in my store. Here's an example of a single layer chocolate cake with white circles icing (I used white vinyl). 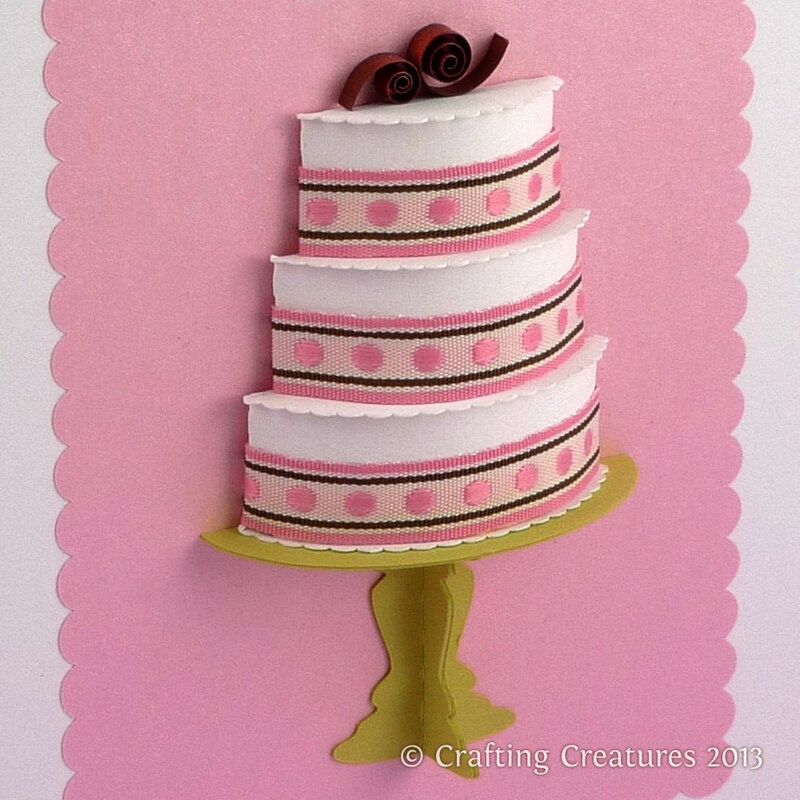 I've seen many examples of polka dotted icing on cakes, and thought it would great to have a matching background. 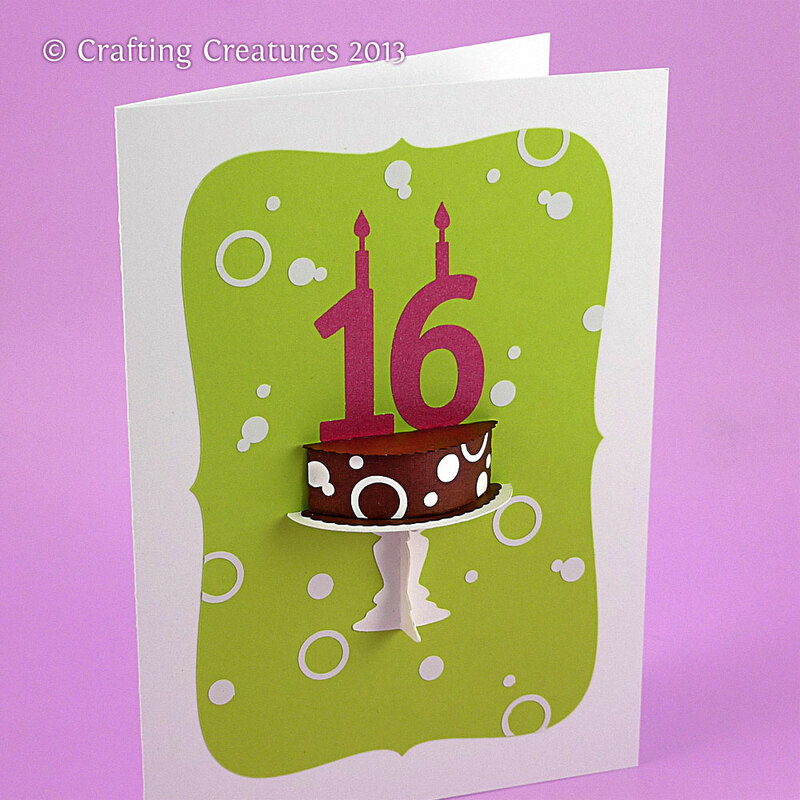 Add a second layer of cake on top and some swooshes to make a classic celebratory statement. I designed a subtle backdrop pattern made of diamonds and left a blank plaque above for whatever occasion you need. My favorite has to be the 3-tier cake. Somehow the more tiers it has, the more fun it is. I decorated it with ribbon and matched the background using a scalloped edge. The chocolate shavings on top were made of quilling paper, but you can just as easily use any brown paper with 1/8" width. What cake would be complete without a cake box? I used some scrap plastic left over from some packaging and glued it with Scotch Quick Dry glue. I also added some easy-open tabs so you won't have to struggle prying open a well-fitted box. All the cards are 5x7 inches. Michelle of MichelleMyBelle Creations made an awesome purple cake with flowers, sequins, and textured backgrounds. I like how she added a bow to the stand which makes it more dimensional. Please let me know what you think in the comments section! These look like so much fun to make too. Thanks for commenting Arlene! Yes they are so much more instant gratification than the real thing and less messy too! These cakes have fewer calories too! Wow what amazing cakes! The best bit they are total eye candy & fat free what could be better? 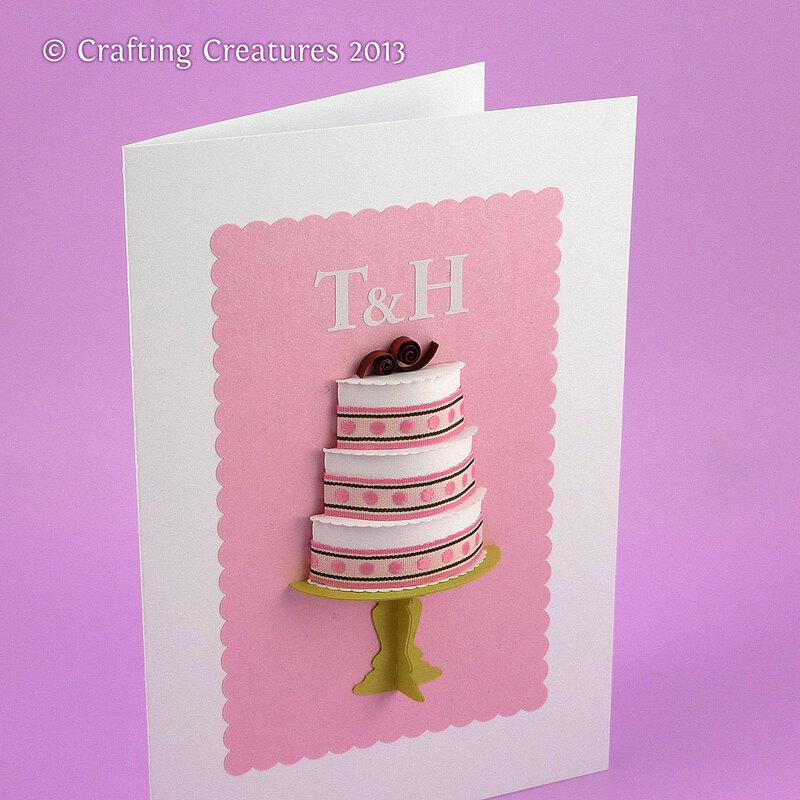 Thank you for playing along with us at Die Cut Divas. Thanks so much Paula. 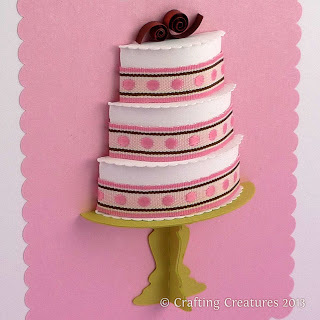 It was great to see what imagination happens at Die Cut Divas. I’m Cecelia Louie. 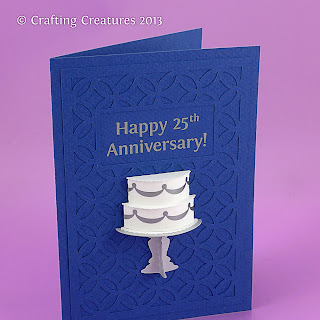 Paper Zen is a blog about paper quilling, SVG cutting, and hand cut printables. 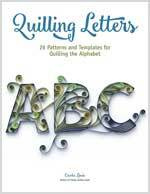 Start Quilling Letters with my new e-book! © paperzen.blogspot.com, 2007-19. Unauthorized use and/or duplication of this material without express and written permission from this blog’s author and/or owner is strictly prohibited. Excerpts and links may be used, provided that full and clear credit is given to paperzen.blogspot.com with appropriate and specific direction to the original content.